City Hall is currently controlled by developers that finance the large political parties. An alternative approach is for council to be responsive to residents, and to promote grassroots democracy. The Mainlander supports candidates who reject corporate control of government in favour of deep political engagement of all affected residents, especially those marginalized by the current system. Vancouver needs far more affordable and social housing, as well as social services for those most in need. Some interests organize against having these important things in their own back yard (NIMBY). Others support inclusion of affordable and social housing and social services in their own neighbourhood (YIMBY), leading by example. The Mainlander supports candidates who promote YIMBY politics. For example, those who support the proposed social housing development at the corner of Broadway and Fraser, or a safe-injection site on the westside, classify as YIMBY, while those who oppose these are classified as NIMBY. For The Mainlander’s endorsements, click here. In general, we endorsed those closer to the top-right “resident-YIMBY” quadrant, and those farthest from the bottom-left “developer-NIMBY” quadrant. Posted in Analysis, City Hall, Election 2011. Bookmark the permalink. Wow! 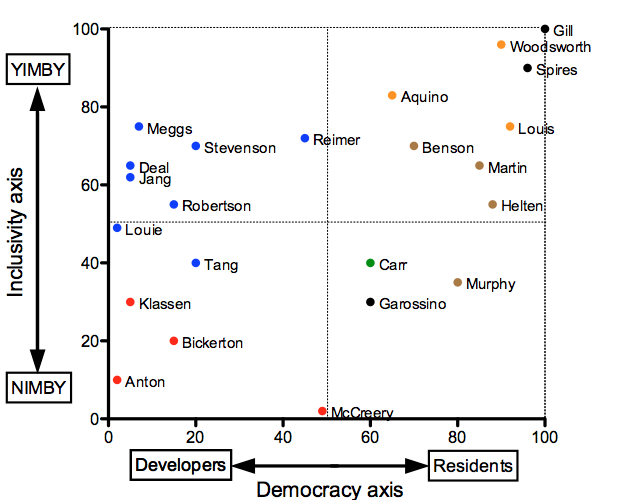 From the community meetings and research I have been involved in Murphy, Carr and McCreery should be much closer to Woodsworth, even Anton is way too low on the scale. The former candidates have the capacity to cross party lines and work together unlike the current VV team who’s lies about transparency, inclusivity and consultation in the 2008 campaign have left us concerned Bush and Cheney could actually be re-elected even here! This crew are rude, arrogant and have NO concern for those that have differing views or have not supported them financially. The only attempts they make to appear they are listenng are through well funded political spin. They are the most devisive and most dangerous for our communities, city and future. They will not work with anyone. It is clear why community groups are stepping forward with little funding to run candidates to save our city. Please vote to stop the insanity of the past 3 years and allow communities to come together to plan, re-establish partnerships with business and other levels of government without further interference. Well, congratulations COPE executive. You destroyed a party with a long and proud tradition in this city. The stupidity of secret deals. Bob: The COPE membership voted by a large majority to support the Vision/COPE deal. There was nothing secret about “it” at all. There was a duly called Special General Meeting on June 26, 2010, which was held. Sorry to rain on your parade !